Window Solutions is family-owned and operated. For three generations, we've served the needs of residential and commercial customers throughout the Greater San Diego Region, and have earned a reputation as a leading supplier and installer of new construction and retro-fit windows and doors. As your local Milgard Certified Dealer, we are proud to help you create the home you and your family deserve. A visit to our beautiful showroom will allow you to experience why so many of your neighbors have chosen Milgard windows and doors for their home. 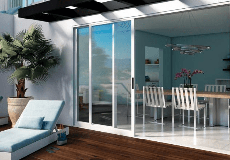 We invite you to experience the Window Solutions difference! El Cajon, Santee, Ramona, Lakeside, Alpine, San Diego, Chula Vista, Bonita, Oceanside, Carlsbad, Encinitas, Del Mar, La Jolla, Pacific Beach, Point Loma, Rancho San Diego, Rancho Santa Fe, Escondido, Vista and surrounding and outlying areas. Window Solutions is rated 4.6 out of 5 by 21. Rated 5 out of 5 by usjm from Installation was a breeze Seriously, from the first home visit to discus what was available and give us a free estimate of costs.... to the second home visit for a final measure and to order the windows.... it was a very calm, peaceful experience. The install was amazing. The guys were very efficient. They left no debris, inside or out. And no damage to outside plants, stucco, etc. These two guys were so calm and self assured, we felt no stress at all. We both noted the perfect, precise caulking. The windows look great. And every person we've spoken with at Windows Solution, has been nothing short of helpful and friendly. All in all..... a great experience! Rated 5 out of 5 by DianeMW from Highly recommend this professional vendor We have some serious window issues going on at our house. We have several windows & doors that have leaked and ruined our new flooring. In addition we have some large custom size windows that are challenging to reach. To start the process, we received several quotes but decided to try out Window Solutions on a portion of our house. They did an exceptional job on the windows. The entire process was handled very well. The owner came out to our house and helped us make decisions and get the quotes going, the installers and drywallers were all professional, courteous and efficient and more importantly did very high quality work, on schedule, as planned. As a result, we will be going with them for the rest of the house. I should also mention that their quote was much more competitive than the other vendors and there were no hidden fees. Rated 5 out of 5 by Linette from Great Response and Service This morning Chris from Window Solution came to repair our crank hardware. He was pleasant, efficient and very responsive to my questions. Also the rep who took my original service request call was awesome too. Rated 1 out of 5 by Raedee77 from Almost 2 months to complete job Please see my review on their web page. It's the MOST CURRENT entry. I don't know how to give 1/2 star!!!! Rated 5 out of 5 by Jane8501 from This dealer is by far the best! I have known the Window Solutions family for 30 years. They are absolutely top notch in every aspect from quotes to the final installation. They were extremely organized, professional, personable and efficient. They were on time and my home was clean when they left...no mess! I recommend them without hesitation. Rated 5 out of 5 by Julie85 from New windows, excellent service Eric and Jesse came to replace our windows yesterday and they were wonderful! Very friendly and very professional. They had no problem with my "helpful" 2 year old wanting to see what they were up to. When they were finished they cleaned up everything and you couldn't even tell they were there. Definitely will recommend Window Solutions to all. Thank you for your great service!